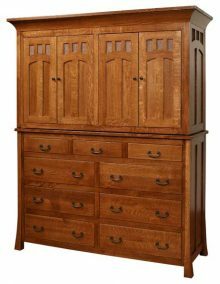 As part of our ongoing mission to provide the widest selection of beautiful handcrafted Amish furniture, Amish Outlet Store is pleased to offer an extensive collection of Bridgeport Mission bedroom furniture. 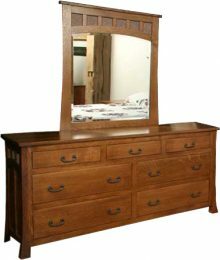 Whether your furnishing needs call for a solid wood Bridgeport Mission bed, bureau, chest, armoire, dresser with mirror or nightstand, you’ll get a top-quality piece that is built to last. Rather than settling for a bedroom set with generic furniture that has been mass-produced and combined for the average person, check out the Bridgeport Mission Bedroom Collection for a one-of-a-kind look in the most personal room of your home. You won’t find the same brand of low-quality, cookie-cutter furniture here that you would in any big box discount store. We know you value quality and craftsmanship, so that’s what we provide in each piece of Bridgeport Mission furniture. Purchasing your bedroom furniture from the Amish Outlet Store ensures no two pieces will ever look the same, even if you purchase the same two types of furniture. 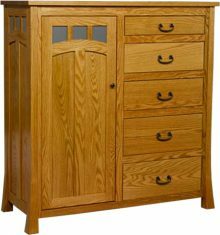 This is because these Amish bedroom furniture sets are handcrafted using all natural Oak, Hickory, Maple and Cherry woods. These woods all have different grain patterns not only based on type of wood, but also based on that specific cut, ensuring a unique look every single time. Many styles have come and gone over the years, but the one piece of interior design that has remained timeless is hardwood. That’s why purchasing the Bridgeport Mission Bedroom Collection is the first step in the customization and creation of your personalized bedroom décor. 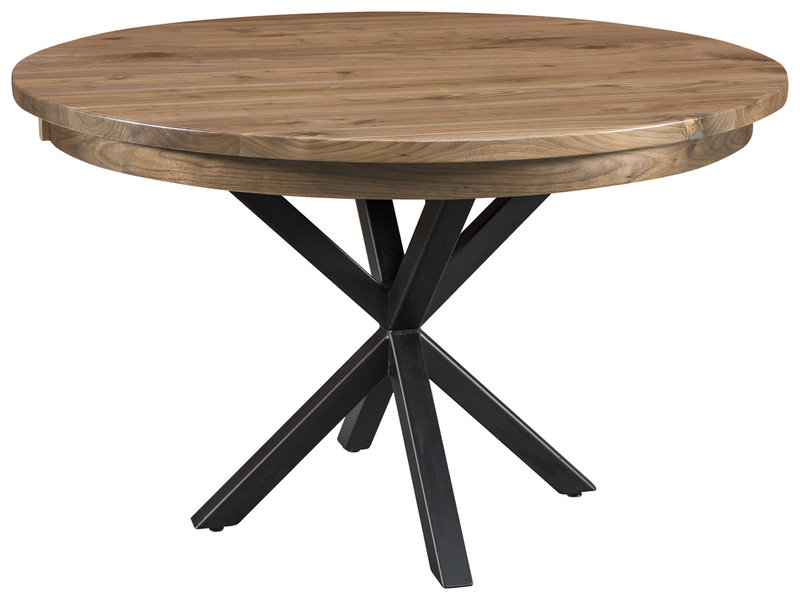 Each piece is an example of the classic appeal of hardwood furniture. Whether you prefer the rugged outdoor look of neutral colors, animal hides and antlers hung over the head of your bed or the more traditional look of pastels and paisleys paired with fresh flowers and antique art, handcrafted wooden furniture fits beautifully in any setting. You can even mix a little bit of an industrial feel into a rustic room by incorporating wrought iron designs, contemporary art and, of course, your electronics. Our team of talented Ohio and Indiana Amish artisans will use your choice of hardwoods and attractive wood stains to create a customized furniture piece. Youll get the perfect complement to your bedroom décor. Because each piece is made completely by hand, you’re always assured of getting a one-of-a-kind product featuring a level of craftsmanship and attention to detail that is immediately noticeable. We don’t sell “cookie-cutter” furniture at Amish Outlet Store! Picking and choosing your own furniture pieces for your Bridgeport bedroom set is one of the best conveniences you can be afforded from a furniture store. The sets you will find in big box stores are already put and sold together, which is why they are called sets. Our options here at the Amish Outlet Store are collections, which means you are in complete control of designing your own set. Purchase anything you want or need without restrictions. 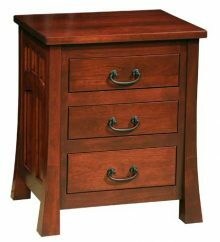 Complete your entire bedroom set with Bridgeport mission furniture from your queen- or king-sized bed frame, to your nightstands, your armoire and even a dresser or two. With two different bed frames, two nightstands, two chests, three dressers and an armoire to choose from, the possibilities for your future room are ample. Take control back and stop buying poor quality, unnecessary furniture just because it is sold together at your local furniture outlet. Don’t compromise on quality or durability when it comes to your bedroom furniture. These are pieces that will be used every single day of your life, so you need to make sure they are built with quality materials and impeccable craftsmanship. 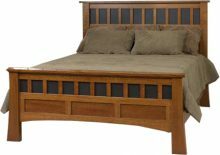 All of the Amish bedroom furniture sets sold here at AmishOutletStore.com are created using high-quality and natural woods by the best Amish carpenters, guaranteeing products you can count on for years to come. 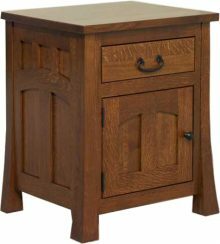 If you’ve had a bad experience buying furniture from other online retailers, then you’ll surely appreciate the Amish Outlet Store.com difference. You’ll benefit from a level of personalized service that is a far cry from those furniture purveyors that seem to disappear after the sale. We’re a small-town, family-operated company located in Smithville, OH. We’re always available to assist you with product selection and customization, ordering and anything else you may need. Order Your Bridgeport Mission Furniture Today and Save Big! 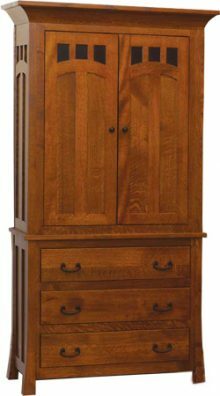 Place your order for solid wood Bridgeport Mission bedroom furniture right now and save up to 33% off of our regular retail price. A wide variety of additional money-saving discounts are also available. Order online or by giving us a call at 1-800-217-6999 today.